Hilbert’s Ashlee King has been nominated for a Local Sports Star award. 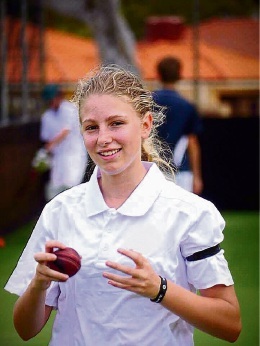 SIXTEEN-year-old cricketer Ashlee King is bowling over the competition. The Hilbert local used to be the undefeated WA state champion for roller skating, representing the state multiple times in national championships, and representing the country at the 2014 Oceania Championships. While she may have retired from roller skating, Ashlee’s superb sporting skills have transferred smoothly to cricket. “My brother played cricket so I joined his club team, and I really enjoyed it. I bowled in the nets to them and joined their team, and then went in to women’s,” Ashlee said. The teenager has just been awarded a prestigious WACA scholarship, which comes with funds to spend on equipment and travel costs. At 15, Ashlee was selected for the under-18 WA cricket team, and she currently plays senior level cricket for Melville along with training at the Perth Scorchers and Western Fury Academy. Ashlee said playing in senior and state teams is a dream come true. “It feels really good, it’s very professional. I love that professional environment, I thrive under pressure. It’s a challenge but it’s really worth it,” she said. WA cricket stars Piepa Cleary and Elyse Villani are Ashlee’s idols, and she said it’s amazing having the opportunity to train with them. As for Ashlee’s ultimate cricketing dream? “I would love to play for Australia,” she said.